Our organization is dedicated to operating in a manner that conserves natural resources and protects the environment. We have developed and efficiently maintained an Environmental Protection Policy to reinforce technical and operational guidelines allowing our company to reduce costs, lower emissions and provide a reduction in energy consumption. Operate in a manner that conserves and protects the earth's resources. Operate in compliance with applicable environmental laws and regulations. Work with government entities towards developing and implementing effective environmental laws and regulations. Provide the support necessary to ensure compliance with applicable environmental laws and regulations. Hold managers accountable for the environmental performance of the company. Encourage process modifications that reduce pollution and waste. Implement programs for self monitoring, evaluation and reporting to ensure compliance with environmental laws and regulations and continuous improvement in conserving natural resources and protecting the environment. Establish and provide mechanisms for employees to report concerns on environmental issues. Develop employees' awareness of their environmental obligations, foster an environment in which employees freely ask questions, and express concerns about environmental issues without fear of retribution, and address employee questions and concerns promptly and thoroughly. Our vendors are associated with green forest certification bodies that monitor and protect the environment. These organizations authenticate that their wood and paper products are responsibly harvested from verified sources. These initiatives are backed by a third party certification audit. We recognize that you as our customer have goals in place to reduce costs and maintain efficiencies, as well as reduce waste and protect the environment. The green policies and processes at Graphic Controls afford us the ability to conserve energy and water, as well as reduce packaging and plastics that are not easily recyclable. These efforts enable us to carry the green initiative from our vendor directly to our customer providing a unified goal of environmental protection and conservation. Graphic Controls is committed to operating in a manner that conserves natural resources and protects our environment. 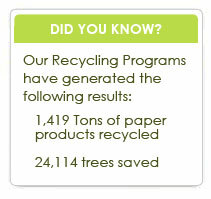 Through our dedicated recycling program, office waste is collected from all points of generation and combined with production waste from our printing and converting process. It is then mechanically sorted for it's content and prepared for recycling.